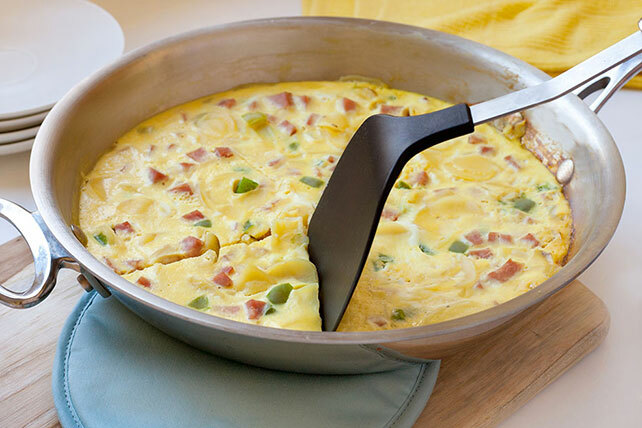 Start your day off right with our Cheesy Ham and Potato Frittata. Our Cheesy Ham and Potato Frittata is so good, you may want to end your day with it too! Cook and stir onions and peppers in large skillet sprayed with cooking spray on medium heat 5 min. or until crisp-tender. Add water, milk, Potatoes and Au Gratin Sauce Mix; stir until blended. Bring to boil, stirring frequently; cover. Simmer on medium-low heat 12 to 15 min. or until potatoes are tender, stirring occasionally. Remove from heat. Stir in VELVEETA Cheese Sauce, then ham. Add eggs; mix well. Cover; cook on low heat 15 min. or until knife inserted in center comes out clean. Remove from heat. Let stand 5 min. before serving. No serving dish is needed! Just cut the frittata into wedges and serve right from the skillet.